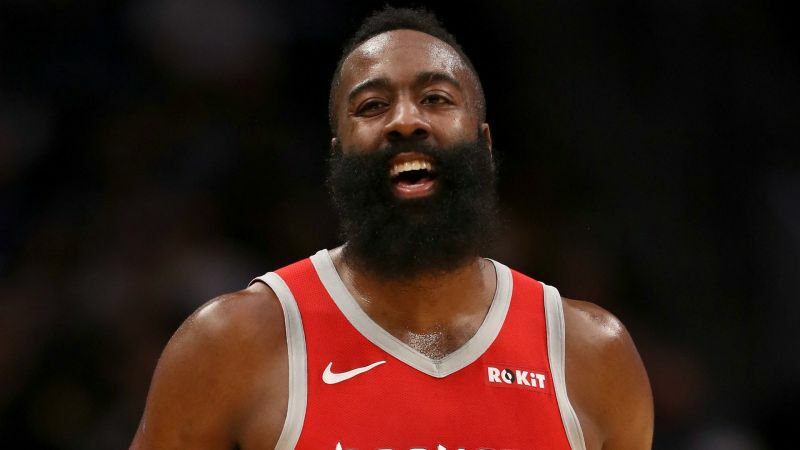 James Harden set his sights on the Houston Rockets earning the number one seed in the Western Conference after his sensational season continued with another NBA record. In 29 minutes and 34 seconds on court in Friday’s home match with the Cleveland Cavaliers, Harden became the first player in NBA history to score a 40-point triple double in fewer than 30 minutes. Harden had 43 points, 10 rebounds and 12 assists in a performance that included eight three-pointers, as the rampant Rockets routed the Cavs 141-113 with their MVP candidate able to watch from the bench for the whole fourth quarter after another amazing feat. The Rockets were 14th in the West at the start of last month, but have won 13 of 16 games to move to 24-17, just 4.5 games back from the first-placed Denver Nuggets. Their 141 points scored was a season-high. “It feels great and I think we’ve all had that in the back of our mind,” Harden said of the number one seed, which the Rockets attained last season en route to the Western Conference Finals. “It was just a far reach earlier in the season. Now it’s pretty close. We’ve just got to continue to do what we’ve been doing. Playing well, taking care of opportunities like this. Just continue to get better, strive to get better. “I think we’re a few games out of the loss column, so just keep going. The West is tough, every single night, so it feels good to have games like this. We did a great job from top to bottom. It was Harden’s fourth 40-point triple-double of the season – the rest of the NBA combined only has one (recorded by the Washington Wizards’ Bradley Beal). He also has at least five three-pointers in 12 straight games, a record comfortably topping the previous longest streak of seven (Stephen Curry), while his run of scoring 30 or more points now sits at 15 games. Harden, who was labelled “an incredible player” by coach Mike D’Antoni, owed thanks to team-mate P.J. Tucker, who made way and boxed out Ante Zizic to allow him to claim his 10th rebound and place in the history books with 82 seconds left in the third quarter. “Dinner, movies. I need a date!” Tucker joked.